I started thinking about the scandals going on with colleges and my college journey; I wrote this last night. Your thoughts? What was your college journey like? Apparently the new norm is being dishonest by helping your child succeed. Unfortunately, this may lead to their ultimate failure since only through disappointments do we learn skills on how to become successful. It seems as if handing out participation trophies has escalated into bribing colleges and altering SAT scores. Some parents are setting their children up for failure by making sure they succeed through cheating, lying and stealing another’s child’s dream. I scored very poorly on my SAT. I actually took the test several times and made lower on the Math section even after being tutored. I was not accepted into the colleges I wanted to attend but was given a “maybe” from a small Methodist women’s college in South Carolina. Not only were my scores low, I also had a learning disability. In addition, my hard-working father did not have a good cucumber crop that year. So my “maybe” from Columbia College looked like a “no-go” since we did not have the money. But, thank God I qualified for a college grant. I was accepted on academic probation to attend Columbia College with a grant, prayer and cucumber rebate money. 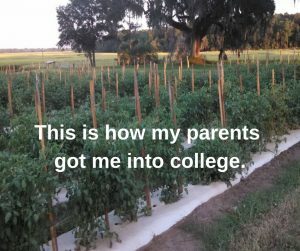 My honest father even returned the Grant money my Sophomore year since he had a decent year on the farm and could afford to send me to college. I believe this struggle made me into the woman I am today. I had to work extra hard with a learning disability, rejection and lack of finances to become a college graduate and attend graduate school. Being denied opportunities can be to our making; it certainly helped me achieve dreams and goals beyond my imagination. I traveled from the rows of a lowcountry tomato field to the runway of the Miss America Pageant to singing at Radio City Music Hall and performing the National Anthem for professional sporting events. I was inducted into the Speaker Hall of Fame and became a best-selling/award-winning author whose comedy is featured on SiriusXM Radio. How did I achieve these goals? I learned to become a successful failure.